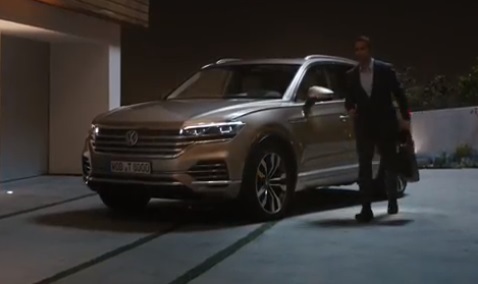 Volkswagen highlights, in its latest commercial, that the 2019 Volkswagen Touareg is a “classy SUV that attracts attention wherever he is seen – in the city and also offroad”. Titled “Driving through the night,” the spot features a man at wheel of the new Touareg, speeding down the city streets and out of the city, at night, enjoying the driving experience and the view, thanks to the panoramic sliding roof (the biggest available in a VW), on his way home. Set to the rhythms of “You Know You Got It” by Production Music, the ad showcases the SUV’s exterior design, with the redesigned front fascia and the headlights “connected” to the grille, full-LED headlights that are powerful enough “to make night-time bright as day” – according to the brand, as well as its interior, which boasts a fully digital 12-inch instrument cluster combined with a massive 15-inch touchscreen. Labeled as “the most technologically advanced Volkswagen,” the 2019 Touareg was unveiled earlier this year, in April. In Europe, it serves as the automaker’s flagship. The revamped Touareg has grown in size, being 3 inches longer (at 192 inches), 1.7 inches wider (at 78 inches), and 7 mm lower (at 67 inches), offering now a more spacious trunk, up from 24.6 cubic feet to 28.6 cu. ft. with the rear seats in place. The third generation of Touareg will be launched in Europe with a pair of turbocharged 3.0-liter V6 diesels rated at 231 horsepower and 286 hp. Later this fall, a gasoline-fed V6 will join the lineup with 340 hp (250 kW) on tap. It won’t be available for purchase in the United States.